A lady called us a few months ago to say she was getting a Golden Retriever x Poodle and that he was to be a large dog when fully grown and what was the best food to start him on. Knowing that large breed dogs are prone to weight gain, especially during their first 6 months, if they are overfed during this period it can lead to skeletal disorders, therefore it is necessary to steady their growth rate and ensure that they receive a balanced diet to prevent future health problems. Our large breed recipes are balanced and come in larger size kibble to promote chewing and prevent fast consumption of food. With this in mind we recommended our Super Premium Large Breed Puppy Salmon and Potato recipe. 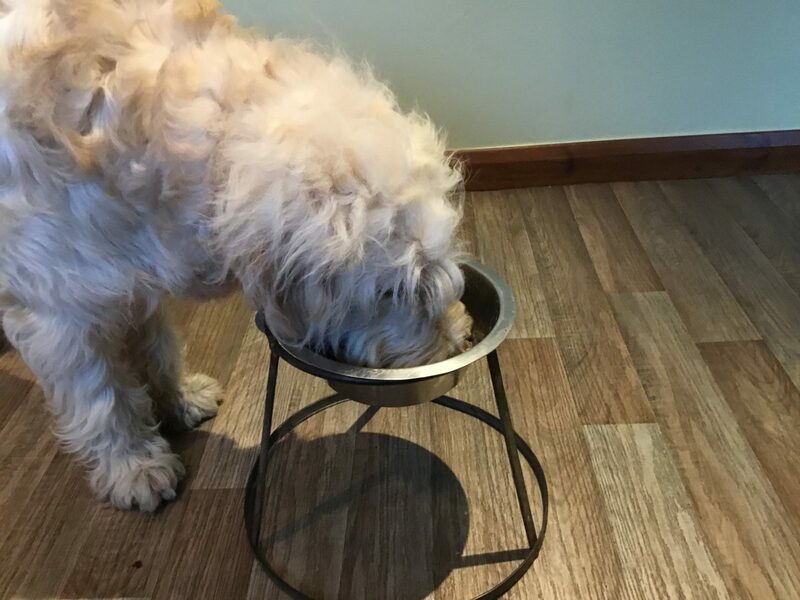 We received this lovely picture recently of Stanley enjoying his Super Premium Large Breed Puppy food fed in a raised bowl to help digestion and his owner says he leaves nothing in his bowl.